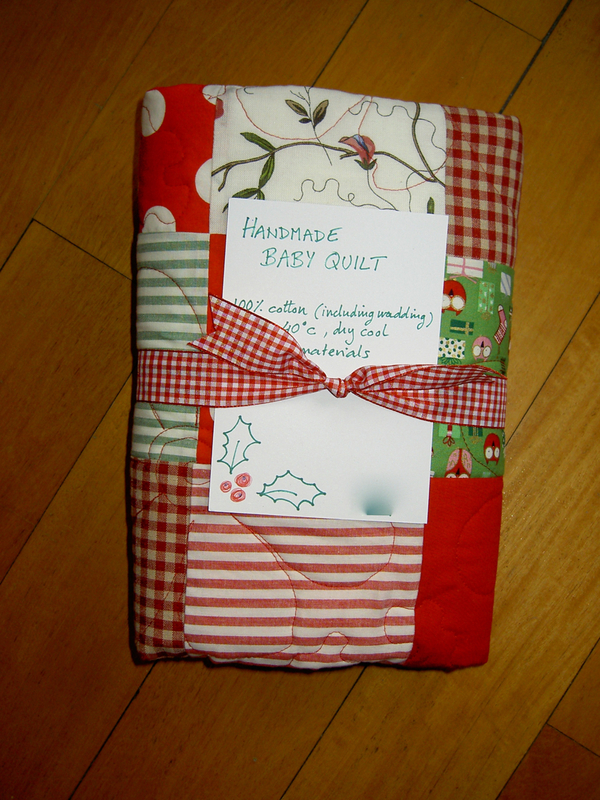 This is a little Christmassy baby quilt that I finished this evening, just in time for the Christmas Market tomorrow (1 Av de l’Eglise Anglaise, Lausanne, from 10am-4pm), on Saturday. Doesn’t it look sweet all wrapped up, ready to snuggle someone small? I got a bit bored stippling it, so ended up making a few rather random free motion flowers in places. Not exactly Christmassy per se, and it showed me just how hard it is to do something regular when you are just going for it, but cheerful enough. 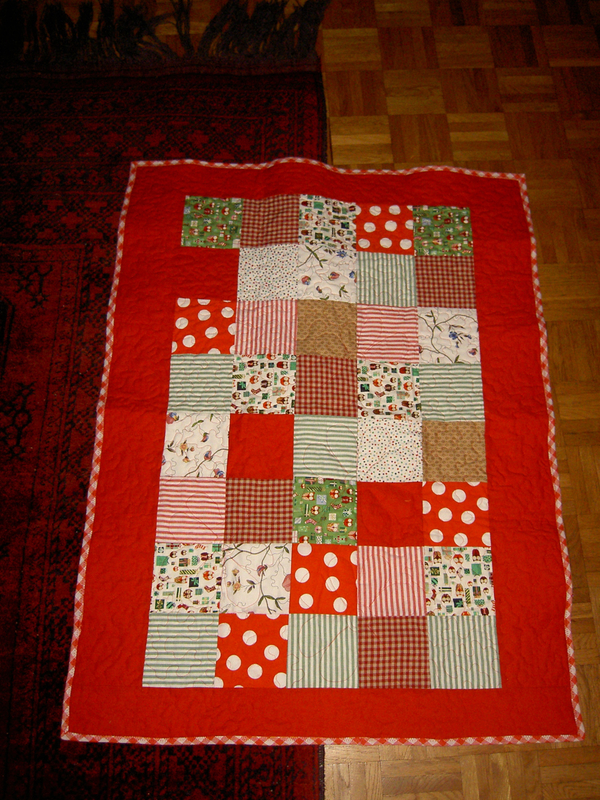 It was made with the squares left over from the previous red creation that still needs quilting. 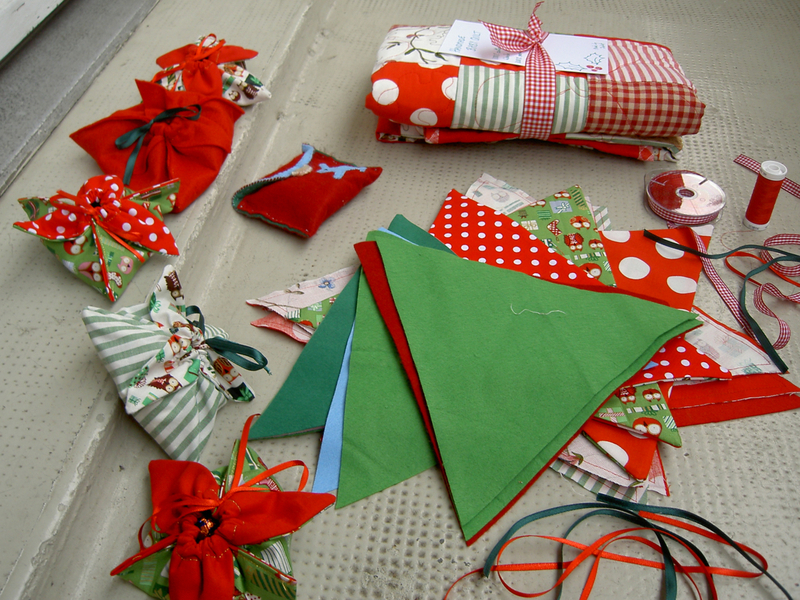 I also finished preparing and pre-making some little bags for my impromptu morning sewing workshop that will happen in a corner of the market. As I am not taking my sewing machine, people have the option of making bags in easy-to-sew felt if they want, rather than quilting cotton. It should be fun. If they finish one, they get a bell on the ribbon and chocolates to fill it with. So come along, dear readers! When the points are red, they remind me of poinsettia flowers. Very seasonal! It’s a pity I don’t like sharing photos or videos of the children on the internet, because I have the sweetest little video clip of Mr A, aged 4, sewing alone this afternoon on my sewing machine. I had shown him how to use it once, a few weeks ago, very briefly, when I was desperate to sew and he was casting around for something to do. He wanted to sew again today — but I was dashing around trying to pack for a night away at my mum’s. It really wasn’t the right moment. It never is, is it? In desperation, I chucked a left-over bit of green felt under the machine, gave him some coloured thread, and showed him how to choose decorative stiches. I propped up the pedal on a cardboard box, and left him to it. He kept his fingers firmly away from the needle, moved his little feet (both of them!) so gently, and managed perfectly well. It was amazing, so calm, so controlled, so focussed. Lifting up the presser foot, turning corners, checking his stitches, changing stitches. It was a revelation to me! Step back, and let him get on with it. “This is the best toy ever!”, he said. He is so right. And, let it be said, he is only four (“… and a HALF!”, he would add). I’m linking up to Amanda Jean’s Finish it Up Friday. So now I can go and see what others have been up to. Yay to some mindless but happy surfing, tucked up under a quilt. Beautiful quilt and I love the bags! Love the mental picture of your 4 and 1/2 yr old working so hard on the machine! Clearly a future quilter. 🙂 I’m coming down to Geneva airport on Monday. Can you recommend any fabric shops or Charity shops? 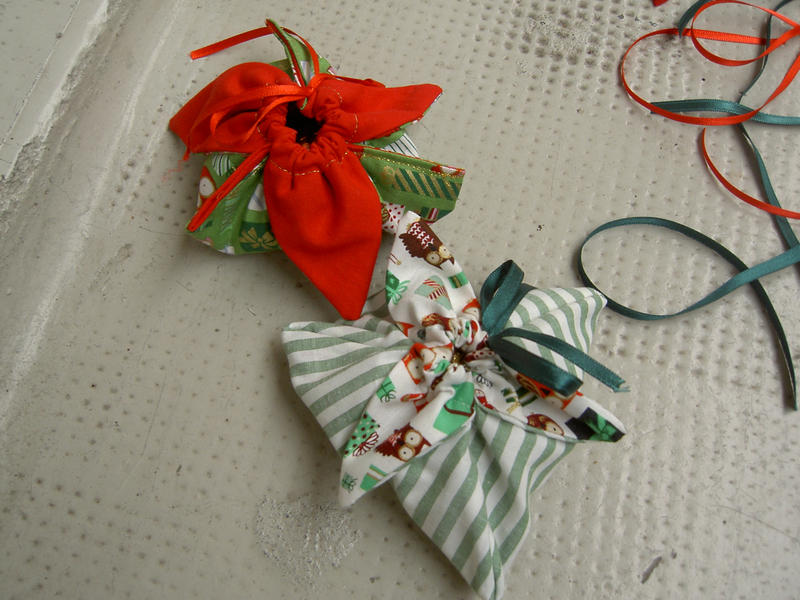 I love the poinsettia looking bag! very cute idea. Perfect Christmassy makes there missus. I can only imagine Mr A having hours of fun and entertainment with mummy’s toy!